After a long hiatus, i m joining my blogging buddies for a mega marathon this whole month. Every year in the month of April and September we crazy bunch do a month-long blogging marathon with a theme following alphabetical order. 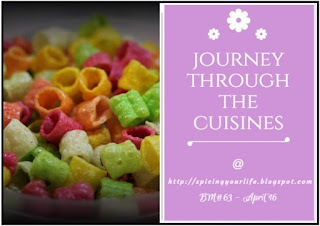 This month we are blogging under the theme : Journey through the cuisines. Some of us picked International cuisine, some super talented buddies have chosen to blog on one single cuisine for the whole month, yes, i can't imagine how they managed to find dishes for every alphabet in a single cuisine, whereas i got my eyes popped with 4 different cuisine!! Ok, jokes apart, it wasn't that difficult seriously. I chose to blog on 4 regional cuisines for 4 weeks, in alphabetical order. So, starting today i will be posting a regional recipe every day. For week-1, it will be Andhra Special Dishes. I have chosen to make Dosa-Chutney recipes for week 1, for the whole month it is mostly breakfast dishes, but not many combo's, like week-1. As i said, i couldn't squeeze my limited brain for more combo's. 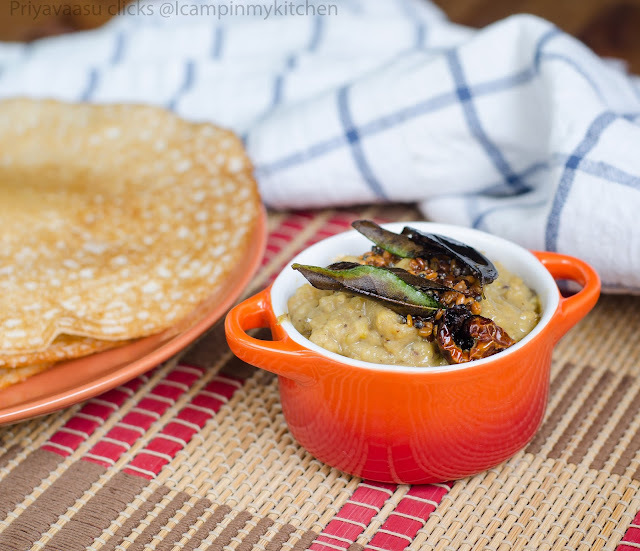 Coming to today's recipe, Attukulu Dosa/Poha Dosa served with Aratikaya pachadi/Raw plantain chutney. I loved cooking and clicking week-1, mainly for chutney's. My elder one loved the spicy chutney's more than the dosa. So, here is to a week full of dosa's with yumm vegetable chutney's!! Oil for making the dosa. Wash rice, rice flakes and dal with water. Drain and soak together in buttermilk for 2-3 hours. After the soaking time, drain and reserve the soaking liquid. Grind the contents to a smooth batter, adding the reserved liquid. If you have soaked for a longer time, you will not have enough liquid, that case use water to grind the batter. It should be of dosa batter consistency, thick, pour-able. Do not dilute by adding more water. To this batter, add baking soda and set aside to ferment for 3-4 hours. After the said time, you can make the dosa or refrigerate it for later use. Dot the edges with gingely oil, cover and cook for a minute or two. Normally the dosa is cooked only one side. But then i flipped and cooked the other side for 2 seconds. 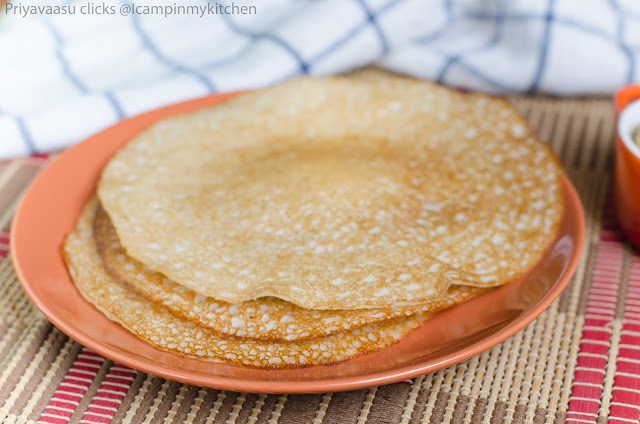 Transfer the dosa on to a serving plate. Serve hot with chutney, i served it along Aratikaya pachadi/Raw plantain chutney. Wow wonderful choice Priya four Indian states interesting. Atukula dosa look so soft and the chutney combination makes it more tempting..
Dosas looks so spongy Priya. Looking forward to all the breakfast combos..
Lovely dosas , bookmarking right away . 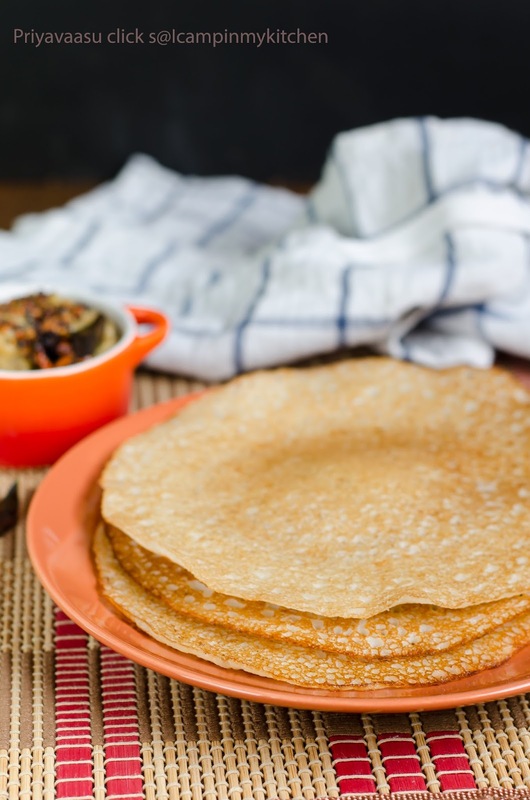 We are a dosa loving family so this week will be a treat . Now i am curious to know the rest of the states. Thats a fabulous combo Priya, now i want to know wat is your next under Andhra cuisine. Loved your choice of cooking from 4 different regions. Keep on going gal. You made 2 dishes with A!Wow girl! !Love the dosa and must check out the chutney recipe next.. I really looking forward to your breakfast recipes and am loving your sub theme. I don't cook breakfast everyday and I always have a hard time coming up with breakfast ideas when I have guests. Curious to know what all dosas you have lined up for us for week 1. The dosa looks perfect and so delicious. I am going to be making this soon. Cannot wait to see the rest of your series. I love these soft & fluffy poha dosas, though I don't make these often. Looking forward to your recipes from 4 states this month Priya. Such a wonderful combo Priya.The dosa looks so soft and delicious with that pachadi. These dosas are a favorite at my place too and that chutney sounds interesting. Looking forward to your Andhra dishes. Love the poha dosa. Soft and spongy :-) All the best and looking forward to your other recipes. Nice soft looking, spongy dosas. I always love dosas made with poha... Looking forward to your regional cuisines..
Priya these dosas look so spongy and tempting. Amazing recipe!! An awesome start to the series Priya. Love Atukula dosa. The pachadi sounds yumm too. Nice choice and interesting sub themes,looking forward to the breakfast recipes..Dosa looks so spongy and finger licking Chutney. Love this spongy soft dosai..Absolutely delicious..
Dosa week looks delightful :-). Nice way to start the day off with!